Eighty percent of Chhattisgarh’s population is dependent on agriculture for its livelihood.Of the 32.55 lakhs farmer households in the state 76 percent fall under the small and marginal category.Currently approximately 28 percent of the area is irrigated from various sources-of this,the largest extent of irrigated land – 66 percent is fed by irrigation reservoirs/canals.Approximately 55 percent of the state’s cultivable land has low capacity for water retention and hence it Is not feasible to take a second crop without irrigation facilities.Agriculture in chhattisgarh is characterized by low incomes,low producticity,and high dependence on rains,large number of small-marginal farmers,low investments,and mono cropping. Only a third of the State’s geographical area is sown and just seven percent is under double crop. Horticulture is growing popularity owing to the high value of produceas opposed to agriculture crops. Accurate (and current) statistical data on horticulture currently appear unavailable and fresh efforts are being made to generate and compile this. The major fruit crops grown in Chhattisgarh state are Mango, Guava, Lime, Litchi, Cashew nut, Chiku (Sapota), etc. Apart from these minor fruits like Sitafal, Bael, Ber, Anola etc., are also grown both as cultivated and wild crop. The total area of the fruit crops in the state is 1,30,098 Ha along with the production of 9,77,832 MT in the year 2008-09. The rural economy in the State is dominated by small farmers (<2ha) comprising over 75 percent of the total farm households. The average size of land holdings in the State is 1.4ha, and is likely to decline with increasing population pressure. Under such a scenario, crop production alone cannot provide an adequate livelihood to the majority rural population, and livestock could emerge as an important source of income and employment for the rural poor. They act as a buffer against income shocks of crop failure, which is a frequent phenomenon in Chhattisgarh. Livestock provide a continuous stream of outputs and thus income from livestock helps consumption smoothening. Species like poultry, goat, sheep, and pigs are of short-generation interval, have a high prolificacy rate and require less land, investment, and operational expenses and are better suited to the resource endowment of the poor. Cattle and buffalo are an important source of manure and draught power, which are vital to improving crop production and environment. Chhattisgarh is rich in livestock wealth. The state has about 144.18 lakhs animal population out of which 94.91 lakhs are cattle, 16.04 lakhs are buffaloes, and the remaining 33.23 lakhs are other animals, which include sheep, goat, horse, and other species. The State has about 142.45 lakhs total poultry population. The fisheries sector has been recognised as a powerful income and employment generator and play an important role in rural economy and is a source of cheap and nutritious food. More than 2.50 lakh fisher folk in the state depend on fisheries and aquaculture for their livelihood. Fisheries sector occupies an important place in the socio-economic development of the state. It caters primarily to the need of socio-economically weaker and backward communities of fisher folk, SCs and STs. Which contributes the poorest section of the society. In addition to this fish is easily digestible and protein rich nutritive food commodity help to remove malnutrition. Absence of forecasting facilities both in terms of weather, disease, and price of the products makes the position of the farmers vulnerable and increases the risk factor manifold. 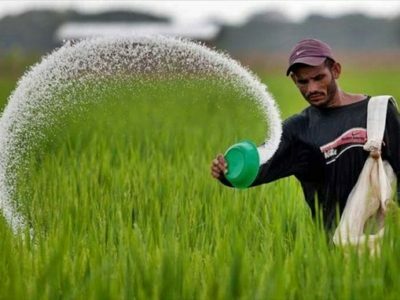 These intrinsic weaknesses coupled with excessive use of chemical fertilizers and pesticides in some pockets are harming the ecological balance and ultimately will reduce the productivity of the crops. Currently, no comprehensive analyses of possible impacts of climate change to agriculture in Chhattisgarh are available, nor are systematically documented anecdotal references to impacts from farmers. At the same time, it is evident that a changing climate can pose serious threats to the existing crops and agricultural practices in Chhattisgarh. Any short-term or long-term fluctuations of climate can have dramatic effects on the agricultural productivity and impact food security. Recent years have seen increased climatic variability like frequent floods and drought affecting agricultural productivity. Adding to it, increased population pressure on the state and subsequently decreasing per capita availability of land is leading to unsustainable practices like monoculture. If global patterns of increase in temperatures and decrease in water availability apply to the State, productivity of most crops would decrease, with greater loss expected in Rabi as compared to Kharif. Capacity building of stakeholders by synergizing traditional knowledge, agricultural heritage and modern technology and research. Mapping the potential of growth: The potential for the growth of agro and forest based industries would be identified in each district of the State. This would be done considering the climatic and the soil conditions. The bio-diversity of the forests would be mapped by the systematic classification of the rare flora and fauna. Developing industry specific infrastructure: The industry specific infrastructure facility would include setting up sector specific industrial parks like an agro-industrial park or herbal villages. Developing other infrastructure facilities would include setting up of cold storage facilities at the district level, developing cold storage chains that would link warehouses to cold storage facilities for perishable horticulture and food products and forest produces, in the rural areas, facilities to sort, dry and pack the agro based products etc. Diversification of agriculture: based on the varying set of climatic and soil conditions offer natural advantage for crop diversification seems to be very necessary. Crop diversification could prove to be an effective tool to cope up with threat of increasing climatic variability. This will take care of sustainability as well as economic viability. Promotion of cultivation and production of high value crops will fetch higher prices to the farmers and hence higher net returns even if the production is low. In regions where it is not feasible to grow high yielding variety or it is not suitable for diversification of crops, value addition to the existing produce would be of immense use. For example, the hills form a natural habitat for growing crops like finger millets, barnyard millets, amaranthus, and buckwheat etc., crops that are rich in nutrients. A number of products can be prepared from these crops to provide nutritional security. This will also co-benefit in sustainable agriculture and on the other hand help in checking migration. Strengthening the marketing base: Setting up an agricultural marketing board would strengthen the State’s marketing mechanism. The market information system would be improved by the e-governance initiatives of the government to provide market-related information like price, demand, etc., to the farmer regarding the agro-based products across the mandis in the State. 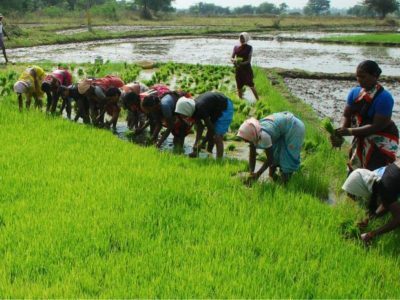 To increase the availability of inputs: The availability of the agricultural inputs in the different regions of the state is being increased by providing considerable subsidy on the inputs. 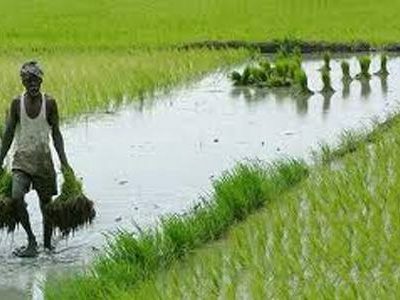 Krishi Mahotsaves are being arranged twice in year in the rabi and kharif season in which all the agricultural inputs are made available to the farmers. Promoting/additional thrust to organic farming: Yield levels can be effectively raised in a stable and sustainable manner by adopting organic farming methods, since extensive use of chemical fertilizers may ultimately lead to soil deterioration. The key objective of orientation towards organic farming is to improve crop productivity, soil health, and the income of the farmers. Organic products have a parallel market, which, if captured in a strategic manner, can lead to the rapid development of these hill districts. Adoption of new techniques: Introduction of new crop varieties to increase tolerance to water and heat stress is needed. Also advancement of planting dates of rabi crops in areas with terminal heat stress, water saving paddy cultivation methods (SRI, aerobic, direct seeding), frost management in horticulture through fumigation, community nurseries for delayed monsoon, custom hiring centres for timely planting, location specific intercropping systems with high sustainable yield index is also required. 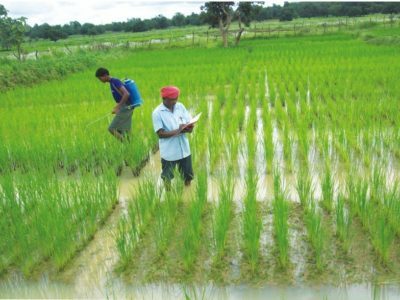 Changing traditional technologies and crop diversification: Looking to the changing climate in some traditional technologies like biasi in rice will be discouraged and line sowing should be encouraged. Also, looking to the water scarcity long duration varieties should be avoided instead short or medium duration varieties should be adopted. Moreover, crop diversification should be encouraged to increase the net profitability of the farmers. Nutrient Management: Appropriate and responsible use of fertilizers and sustainable nutrients can make a contribution to helping plants capture more carbon, fostering higher yields and slowing the decline of soil organic matter. The emissions originating from fertilizer use by farmers should be weighed against the net benefits of using fertilizers to increase agricultural productivity on the same amount of land, thus reducing the advent of land-use change and increasing the carbon content in soils. Soil Conservation: Conservation agriculture techniques such as low or no-till agriculture, made possible through the use of herbicides and herbicide-tolerant biotech crops in appropriate and carefully managed cases, prevents wind and water erosion and loss of ground moisture, improves soil biodiversity, has the potential to increase soil fertility, and reduce carbon emissions. In addition, by limiting soil disturbance and promoting a permanent soil cover, conservation agriculture can contribute to limiting emissions from agriculture by increasing soil carbon content and preventing erosion. While the strategies outlined in the State Agricultural Roadmap and herein are consistent with the sectoral imperatives of the NAPCC and the National Mission for Sustainable Agriculture under it, the State will also take specific care to ensure that specific action plans developed under the CSAPCC are also consistent with the same. The strategies under the agriculture and allied sectors under the CSAPCC also additionally have linkages with the National Mission on Water, National Mission for a Green India, National Solar Mission, and the National Mission on Strategic Knowledge on Climate.